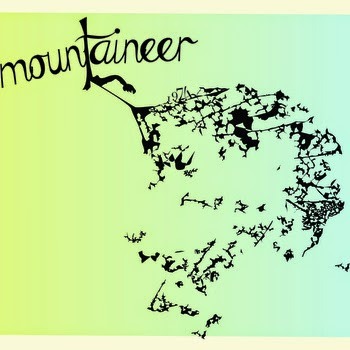 Mountaineer? A name that was not known to me until recently. Looking on Bandcamp there are even two other Mountaineers present. One from L.A. and one from Scandinavia with an ! behind the name. We were not confused as we found Marcel Hulst, who featured on this blog before with his band Maggie Brown and was interviewed by us earlier this year and Mountaineer is the name under which he released his solo album called 1974. Fans of Maggie Brown and especifically those who like the small and intimate side of the band can purchase this album deaffolded. The voice, the songs and the atmosphere are all there. The main difference is that this is a solo album. Everything is downsized to Mountaineer size. An acoustic guitar, a ukulele and here and there something extra is added, in an intimate, modest way. These words define 1974, but it works. Although 1974 does not have the impact 'Maggie Brown' had on me, but isn't that the fate of almost all second and further albums? It even happened to 'Dark side of the moon' after I had got to know 'Wish you were here' first. Those albums tend to grow on you or not. So there you go. Mountaineer builds an atmosphere on 1974 that encapsulated you if you allow the album's songs to do so. Slowly but deliberately the listener is drawn into the album, song by song, until you surrender to 1974. The soft voice of Marcel Hulst, the subtle accompaniment and the stories sung do their work in an unobtrusive way, but find their way they do. Again Marcel Hulst takes us around the world. Canada, Kowloon, the sea, a river. It all comes by as a means of escape, "Where I leave it all behind" he sings or at a minimum to travel to, with ('Submarine') or on. Travelling is a strong source for his inspiration in writing songs, perhaps even his favourite way of life. Of course this is only the start of any story on a record. The main story is the essence of Mountaineer's music. My guess is that if you don't fall for 'Submarine' and especially after the soft played drums and that magical, timid electrical guitar part join in, you can stop listening straight away. The song slips in and out of accompaniment. Just an acoustic guitar, arpeggiated notes and Marcel Hulst singing over them. This is the standard of 1974. Songs so small and softly played that anyone can miss them by not paying attention. That would be a shame, as Marcel Hulst proves his quality on 1974. 'Maggie Brown' was no coincidence. The intention behind the two albums may be different, the quality and the way I'm drawn towards the music is not. To make a long story short, anyone who loves the soft side of Simon (& Garfunkel) or Donovan to name a few oldies and all who followed in their footsteps, may lose out on a great record if they do not check out Mountaineer's 1974. Small can be great and modesty fantastic. Mountaineer catches some beautiful moods and melodies on record. A melancholy treat. As an aside. How come that when listening to the title song that my mind tells me the phone is ringing far off? The phone in 1974 that is. It happens a few times in the song when I have it on the ear phones. Funny, that distant memory, triggered by some vague keyboard sound in the background.